Welcome fellow travelers, visionaries, and agents of change! This is a blog exploring the co-evolution of humanity and our technologies. I started writing here back in 2009 while I was working on my MA in Media Studies at the New School in NYC. My passion has been in watching what is happening at the intersection of technology, communication and culture – how people are using the web and peer-to-peer technology to more effectively self-organize, collaborate, build community, and accelerate social innovation. I feel that we are a global society in transition. Many of our traditional institutions are failing or just broken. The narrative is broken. The idea of ‘us verse them’ doesn’t work when the realization is made that we are all co-existing in an interdependent set of systems. We are now in the process of telling a new story about how civilization can function in a way that incorporates sustainable practices and leads to resilient and thrivable societies. New models are being created for open collaboration and open enterprise, for complementary and alternative currencies, for governance, and for spirituality and empowerment. These experiments are inspirational and give me hope that we are reaching the tipping point where a critical mass of people on this planet (much less than I would have thought was necessary) are waking up to our true potential as a globally networked consciousness. I am scouting the edges of technology and innovation, right where the magic happens. Thanks for joining me on the journey. Below is a bit more about what I’m up to. Contact Conference – I’m Executive Director for this event, coming up in NYC Oct 20, 2011. We’re bringing together the people building the new p2p global paradigm . 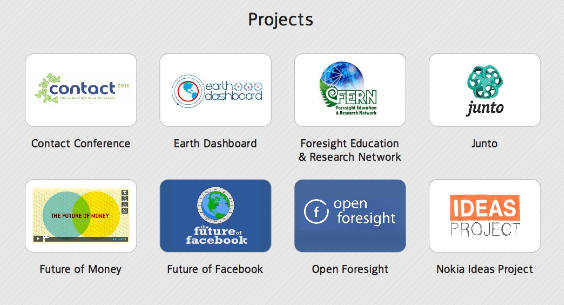 Earth Dashboard – I am an Advisor on this project, a multimedia real-time display that will be installed at the United Nations Headquarters in NYC. Open Foresight – This is a methodology I’m developing with friend & collaborator Alvis Brigis, to enable better ways to build knowledge and visions of the future together. Future of Facebook Project – This is the first Open Foresight project we’re currently working on – a 6 part video series to explore the future of this social media juggernaut. Future of Money Project – This was a video I co-produced for a speaking event I did last Fall at SIBOS in Amsterdam. It got picked up in Forbes, Huffington Post, and Fast Company. Foresight Education & Research Network – I’m a Director for this initiative to spread “futures thinking” and foresight education into the mainstream. Junto – This was a project to launch a video-based discussion/collaboration/action network. Still trying to figure this one out. I also do guest posts on other blogs occasionally. Below are a few places you’ll find my work, like Georgetown University’s peer-reviewed journal gnovis, SpaceCollective, socialmediatoday, unstrucuture, grow, Blogging Innovation, Media Rights, and MemeBox. Most recently my writing was featured on CNN.com. At the moment, I’m navigating myself through the murky waters of entrepreneurship and building a business around my passions. I am working with a globally distributed network of collaborators – artists, designers, thinkers, developers – to assist mission-driven organizations in spreading their messages, building movements, and impacting positive change. Would love to talk to you about your interests, direction, plans, present work. You can email me at fwspencer4@gmail.com. I am based in NYC and want to say I love your blog. I am working for a client (FORTUNE 500 company) and would like to discuss mutual opportunities. Vanessa, thrilled I “stumbled” upon your blog this morning. I’ve been incorporating complex adaptive system analogies into my social media presentations for a while now. Good stuff here. Hi Venessa, I very much appreciate your blog and your way to write and examine the thing. Greetings from Europe! I am in the process of getting my BA in communication right now and I just want to thank you for being a trail blazer in the industry. I look forward to seeing where your career takes you next. I am getting great insights from your blog. Thank you for posting useful interesting content! I caught up with you on your great piece on visualising human capital on Gnovis: http://gnovisjournal.org/blog/future-collaboration-begins-visualizing-human-capital#comment-359 A colleage just came across it elsewhere, which led me here. Great site. Yes the follow on Twitter text is too teeny, but what can you do! I haven’t looked around, but will. Just wanted to say hi again and good luck. We’re moving quickly too now. HubCap Digital – http://www.hubcapdigital.com – our digital library (and soon to be community) hub for future human capital ideas is in Alpha, so please feel free to drop in and share your ideas if you can. Will look around now! Thank you Eric, you just made my morning! I’ve been having so much fun writing and exchanging ideas with people – and if it helps someone to see things from a new perspective, it’s totally worth it for me. When you ask if Twitter (and other social platforms) might grow to become a global human consciousness, I would say it already has. I call it a giant, collective Super-Ego, one that must be cared for responsibly and diligently. Maybe we can chat a day and exchange ideas: I’m thinking about doing a research on the emerging of global consciousness (human development, democracy) thanks to the rise of social networks/collaboration (Castells, Wealth of networks etc) thanks to advancements in new technologies (a la Kevin Kelly, open-source). But the idea is still really really really raw…. How is the rooster project (on real estate) going? I find your blog fascinating. I really like your values based society chart. I just did a webinar called Thought to Insight using mind mapping software developed by PersonalBrain. I would welcome your input and comments if you have time to watch it. (URL indicated in website window). First time I see your blog and I like what I see, but. I also like most comments I have read here and everywhere, see a “beehive” society coming, the net creating a network of people doing the right thing for the planet, but, again the BUT, I fail to find real down to earth first steps. As long as it stays hypothetical and just a nice futuristic theory, no one in control of a real market will invest in it. Capitalism is needed to get to the final stages of creating a better world, we have to create real feasible business models in which many people from around the world benefit from the spontaneous actions of most of them. Still mulling things over, should write something soon. Ps. You are not listing the http://www.longnow.org site anywhere, haven’t you seen it! Many hours worth listening to. This is a terrific blog that you are developing ! It demands a truly holistic understanding as to fully appreciate all the great posts that are being born . Your approach is so innovative and capitalizing. Things are wonderfully intertwined and are a joy to analyze. Keep it going the way you have stared it ! 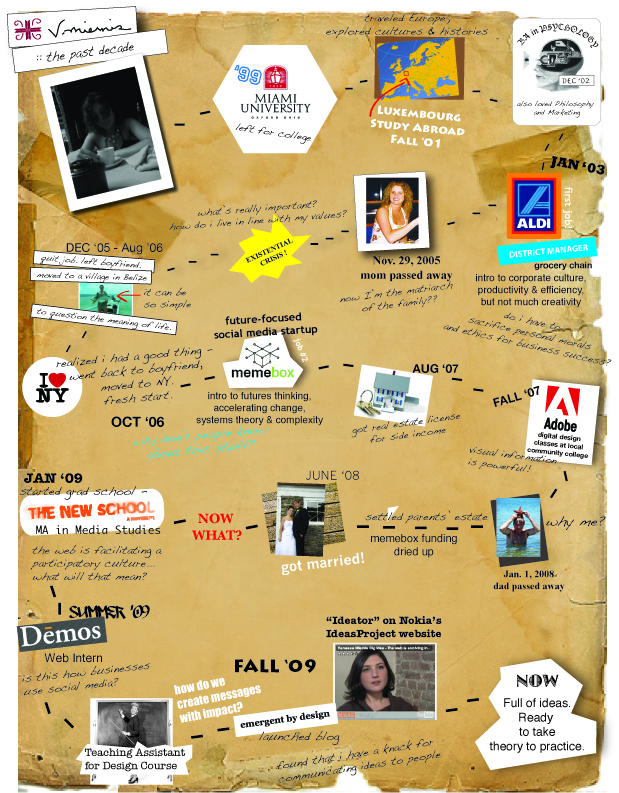 Hello Venessa, absolutely loved your visual resume idea – how innovative! I very much look forward to reading your blog having discovered you just today. I am a learning specialist based here in the UK and know / follow some of the people in your blogroll already – I will take great delight in adding you to my list. yes, absolutely. i hope they are useful for you! thanks! Your blog is amazing! Your ideas are brilliant! I am the founder of the Multitude Project. I realize that we have a lot in common. Can we collaborate? i’m unfamiliar with the multitude project. do you have a link to more info? Vanessa, just click on my name above. Just stumbled on your blog, and I saw some interesting perspectives … will go trough your history! I am overwhelmed with your stuff. I really feel connect with your story. Connected with how you came about to do what you are doing. Connected with the metastory you tell. thanks raf, i’m glad it’s resonating. Fantastic work you are doing… I have been working with http://ahead.com for the last 3 years designing an online collaborative tool for visually oriented people… I’d like to invite you to sign up for a free account and if you are open for it, I’d love to have a skype chat to brainstorm about how our tool could be enhanced with real-time and asynchronous features… what tools are you dreaming of to enable the online design interactions that you long for? just getting through inbox, checked out ahead.com – looks super cool! i created an account and will hopefully have time to play with it over the holidays. thanks so much for the heads up. Hi Vanessa, I’m so happy to have found you and your blog! I love your visual résumé, it’s very inspiring. I’m friends with a couple who are soon to launch an interactive storytelling site for children, and can’t wait to share your ideas and thoughts here, specifically about how they may be able to make their site more of a “collaborative on-line social network” rather than simply a depository of stories from around the world. As a photographer, I can clearly envision children creating and sharing their own visual stories (like your résumé) and possibly making crucial links to the folklore from around the world that connects us all. Thank you! thanks diana, glad you find it useful! I’ve just start discovering complexity emergence and really amazed with your work and surely I will be needing some guidelines and help from you if you will. Nice to meet you at the SOFA conference… I will keep an eye on your work. My blog is way less visited and active than yours but, anyway I submit it to you as promised. I am following you on twitter…Follow me back and we will be able to stay in touch. Speaking of which, have you ever seen these videos I made? … by the way, I’m in Hartford for a couple days, and will be in New York shortly. I would love to meet up (I assume you’re still there, after being at the New School?). … I was thinking of visiting other places in Brooklyn, like NYC Resistor (I saw that you were at a hackerspace in Berlin… I helped start one in my town as well). Would you suggest anything? In other words, we should be friends. Feel free to connect with me on facebook, linkedin, and email me any time (I believe you have my email with this blog? )… I really need colleagues, because where I live, things can be a bit lonely with these ideas. I just read your piece “Guidelines for Group Collaboration and Emergence”. As a former biology student I could geek out on feedback loops forever so…… thanks for that. As a current student in product design, the salience of the topic as it relates to the creative process is obvious. There is a lot of really good information in there that I will take with me to future collaborations and designs. About your tweet “so if i make more $ i get to pay less taxes?”. I just read this article. Thought you might be interested. I read couple of posts (came through facebook currency) and liked them. Facebook currency post ofcourse blew me away. I still try to think that facebook is a timewasting platform , which got lucky, a hype/fad and the most I don’t like about it is the lack of control by the user and the creator’s whimsical features. I could go on, but I realize it is out of context. But I could see other changes it could bring to the society by looking at your post. I will stop by when I get time again, I am sure I can learn lot by reading you. A comment about visual resume : it looks nice, like a story. However, very hard to read. The enlarged view also will have small font. I downloaded image to zoom further, however the black text on white background is so light, the blue and yellow backgrounds to the boxes (existential question and the star) didn’t look well for me. Just a feedback, am sure you know more about visual media than me. i did the visual resume a few years ago as i was learning photoshop…. it’s sorely in need of an update, so thanks for the reminder. i’ll try to get a new version up in the next few weeks. Everybody else has already stated their thanks about the content, just wanted to contribute with my own about your visual resume. hi vanessa, i have been following for a year now, and i always wanted to thank you to spread all the wisdom. i am an Industrial designer from Colombia trying to change the way we see design and working in diferent proyects about encourege people to bike. i ahve meet in the outpost of kaospilot Benjamin Aaron and he push me to write you about the proyect that i am developing right now. is a p2p to encourage people o bike but like a game. to create comunity and collaboration between people to bike. bye and for sure i will continuo following you. It was a pleasure and an inspiration to meet you and spend the day together with Heather Gold workshopping unpresenting in Oz. I look forward to exploring your blog. It’s an absolute inspiration. great to meet you too, debi. You’re blog is awesome and your ideas are really inspiring. Here in Brazil we have some good initiatives on sustaintability and technology convergence, but we still in the beginning. I’m always looking for way to help and improve people’s life and I’m very pleased to know that exist people like you spreading these ideas. My name is Adrian Adler I’m a student at the Kaos Pilots in Denmark. I learned about your blog through Benjamin Aaron Degenhart, so I assume you know about my school. I’m going to New York Tomorrow to do a systemic process with some part of the Occupy Wall street movement as my final project on our process semester.. Your last post really inspired me, so I am wondering if you could find the time to meet over coffee and discuss how to approach working with a movement from a systemic standpoint. It seems to me that one important dimension of this kind of project is (human) language. PS – This comment is my own opinion and does not engage my employer. are there any particular pieces by michel serres available online that i should check out? Yes there is a particular piece. Unfortunately, as far as I know, the piece is not translated in english. The text is brilliant but very difficult to translate. wauw.. Some of the more interesting about-page I have seen in a while! Awesome work – love it! You’re publishing some really thought provoking ideas. Keep it up. Vanessa, It is such fun and gives me such hope to see folks taking up ideas and concerns I’ve had for the past 20 years, or so. One thing I don’t see discussed here are values and the decision-making processes that stem from them. This is where I’ve landed after years of reflection. The biggest challenge, I think comes from creating coherence. We have grand ideas and strong beliefs, but we do not recognize if they hang together, or not. I watched a movie last night (Thrive) where they stated “we are all one” and proceeded to act as if that was the basis of everything they were saying, but they ended up saying that we promote no violation of others, except in self-defense. SO, if “we are all one’ just exactly who are we defending ourselves against? 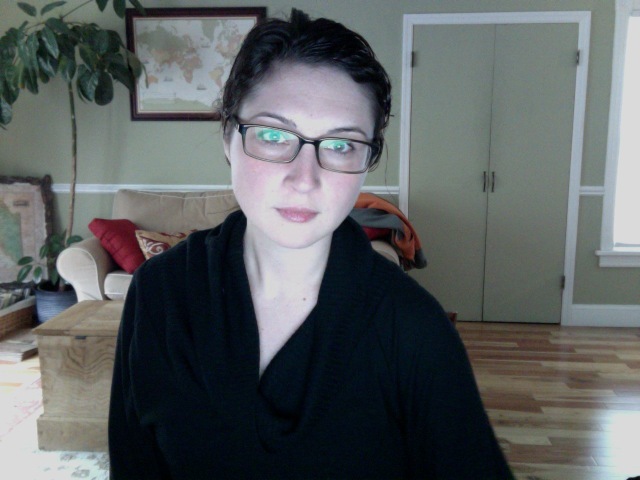 It is this kind of fuzziness I’m trying to address. I’d love to have partners to explore and test my thinking…. Check out my work at http://www.ethicalipact.com. I totally agree. The area of values are under studied and undervalued (excuse the pun) yet in my opinion drives all decision making whether we know it or not. I’d love to study the area of axiology ( the philosophical study of value) yet I find very little on the subject, unless it’s about morals or ethics. Can you recommend anything? Looking forward to developing my knowledge and insights in this area. I’m working with a master’s program in Sweden called “Sustainable Product-Service Innovation” – would love to have you stop by and talk with our students if you’re ever in the neighborhood! Hi Vanessa, thanks so much for your amazing work. I am interested in learning more about your excursion to Mexico in 2010 (https://emergentbydesign.com/2010/11/30/creative-entrepreneurship-day-1). Would you be willing to swap an email or two to briefly discuss? Thanks so much! myself. I look forward to future possible synergies. I’m a Danish student writing my MA on networked global problem-solving and global consciousness focusing on different campaigns such as kony2012, Avaaz and Israel-Loves-Iran. I would really like to interview you via skype or email on these matters. since I book marked it. Money and freedom is the greatest way to change, may you be rich and continue to help other people.